We’ve retained our Customer Service Excellence accreditation following our recent assessment. We were assessed in August 2018 as part of a 3 year accreditation cycle, where we are assessed against 57 standards across 5 domains. We retained our accreditation status and improved on the results from 2017 by closing all partially compliant elements and achieving an additional 4 ‘compliance plus’ elements. We now have 11 compliance plus elements and 46 fully complaint elements. 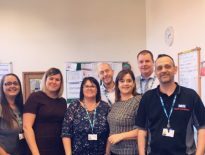 A range of services participated in the assessment including mental health inpatients, older people’s services, CAMHS and end of life care as well as senior managers, library services and Creative Minds. The Customer Service Excellence standard aims to make a difference to service users by encouraging organisations to focus on their individual needs and preferences.